Few nations have a more profound love for bread than the Dutch, who consume more than 138 lb of the stuff per capita every year. Dutch consumers often buy whole wheat or multi-grain loaves on weekdays and more luxurious or indulgent breads and pastries on the weekend. In fact, according to a recent study, three quarters of the Dutch population prefer whole wheat to white bread. 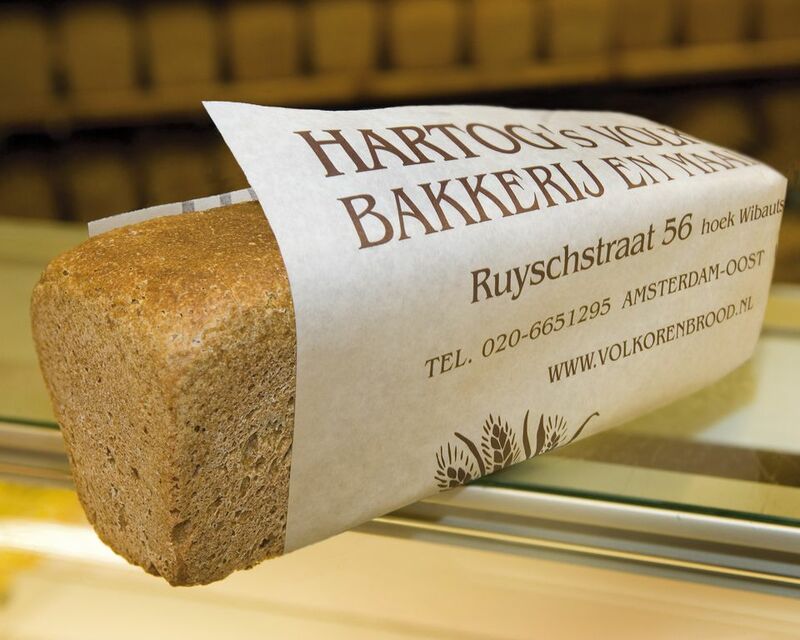 Hartog's Volkoren Bakkerij & Maalderij is a small artisan bakery in Amsterdam, specialized in whole wheat baked goods. Its almost cult-like status means that people often line up around the block in the pouring rain to get their eager mitts on the bakery's wholesome creations, such as this nutritious whole wheat bread. Fred Tiggelman, the bakery's owner, kindly gave us permission to share this recipe with you. The bread has a dense, hearty texture, which makes it ideal for that typical Dutch breakfast favorite, the uitsmijter. Measure out the flour and salt and mix into a pile on a clean flat work surface. Using your hands, make a "dam" in the middle, making sure that all sides of this "dike" of flour and salt is of an even thickness, so that the dam won't break when you add the water. The dam should measure about 8 inches across (about 20 cm), roughly the length between the tips of the thumb and pinkie finger of an average sized hand when stretched out and spread as wide as they can go. Dissolve the fresh yeast in the water by rubbing the yeast between your thumb and your forefinger until it's completely dissolved. Add the water to the dam. Just add a bit at first to see if the dike holds, and if it does, add the rest. Using the tips of your fingers start amalgamating the inner edges of the flour with the water and upping your tempo keep mixing until you have a thoroughly mixed dough. Now start kneading the dough, pushing it away from you with the ball of your hand and using your fingers to bring it back towards you. Try to keep a good tempo here, kneading by hand or using a mixer with a dough hook attachment, adding up to 1/2 cup of additional water, as needed. Make sure the dough is wet but not sloppy. After 15 minutes of kneading, the dough should feel wet and supple (spongy), but not sticky. If you stretch the dough into a ball you shouldn't be able to see cracks on the surface and you should be able to stretch it (this means that the gluten has been activated). Form a ball with the dough and wrap it in a (clean) warm, damp tea towel. Allow to rise for 30-45 minutes at room temperature. The dough will increase by about 1/3 in volume. Remove the tea towel, pummel the dough with your fists and then form it back into a ball, wrap in the tea towel and again allow to rise for 30-45 minutes. Grease a bread tin with olive oil. Wet the work surface with some water. Remove the tea towel from the dough and press the dough flat onto the wet work surface. Shape the dough into a sausage-like shape with your hands, so that it is roughly the same length as the bread tin and place into the bread tin. Cover the bread tin with the warm moist tea towel and allow the bread to rise for another 30 minutes, or until it has increased by 1/3 in volume. Meanwhile, preheat the oven to 428 degrees F (220 degrees C). Reduce the temperature to 392 degrees F (200 degrees C) and place the bread in the oven. Remove the bread from the tin. If you knock on the baked bread it should sound hollow. If it doesn't, return to the oven and bake a little longer. Buy the best, freshly milled whole wheat flour and check that there are no additives: the only ingredient should be the wheat. After all, the whole point of baking your own bread is for it to be pure and wholesome, without all those additives, sugars, fats, bread improver and other rubbish you'll find in many commercial loaves. It's important to use fresh yeast here. These little cakes of solid yeast can be bought at bakers and health/whole foods stores. Always buy this ingredient fresh, because fresh yeast doesn't store well.